But then I remembered that I'm still sick, and even though the pills I'm taking help me to breathe, it still feels like my head is going to detach itself from my body every time I cough, which, while less often than a week ago, still happens often enough that I sorta wish it WOULD just detach already because I. AM. DIED. In other head-related news, I have had a song stuck in my head for two days. This is a problem, because the only way I have ever been able to unstick a song from my head is by completing all verses of the lyrics, and this is a relatively new song (to me) and I don't know the lyrics, so I have the chorus stuck in my head on repeat. At least it's a good song? I also realized that I never told you that we OFFICIALLY only own one home. We also OFFICIALLY will be residing in our current home for at least three years because our credit is very screwed up now, and for that I thank you Arizona economic crisis. In other OFFICIALLY OFFICIAL business, I have been going to bed at a fairly reasonable hour of late. And of late late, as in the last week, I have been going to bed at an unfairly reasonable hour called seven in the p.m. Meanwhile, I am going to start writing down all the things I say to my children while I am on the phone. Because my children think that me being on the phone means that they have free reign to terrorize any and all parts of the house and/or any living thing therein. 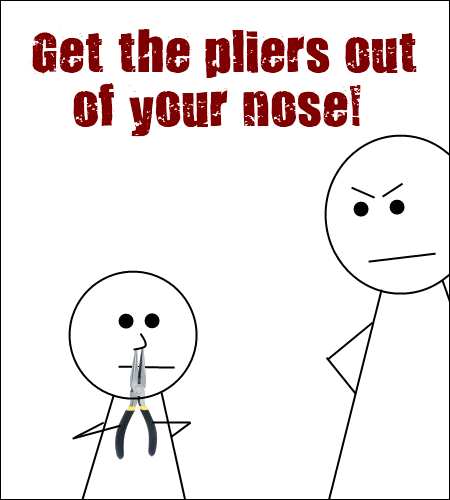 "Get the pliers out of your nose"
And on that glorious note, I'm out.